One thing that I really love about putting together outfits is when I find something that perfectly captures my mood. I'm a very intuitive dresser in the mornings and I feel like I have to exactly match the mood I'm in for my outfit choice of the day. I don't really have "go-to" outfits and I rarely wear any combination of clothes more than once, so this outfit was particularly memorable for feeling quite perfect for that day. As you can see in this impromptu photo sesh, I wear my makeup pretty natural for work. This is very typical of what I wear on a daily basis since I don't want to spend too much time in the mornings to get ready. For some reason I always bring a lip product with me but I never reapply lipstick or gloss after I put it on in the mornings. Silly, right? Anyway, hope you enjoyed the look! 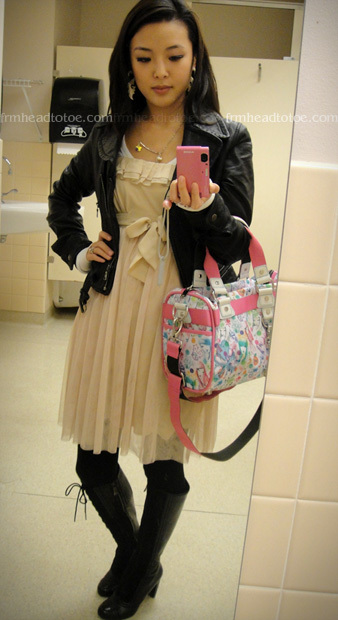 I have a few more OOTD's that were in storage so I might throw those around more often in the next few weeks. I'm pretty sure I'm still mega-fail at doing videos without a tripod so I'll have to figure out a way to do outfits in a more attractive manner in the future. Hi, I like the idea of mixing hard and soft elements, but those boots you're wearing weigh down your outfit and make your legs look shorter. I would suggest wearing ankle boots to offset this. So pretty I would def wear this look out !! I agree with Kit Kat regarding the boots. All I see in your outfit is the jacket and the boots -- the rest of you doesn't exist for me. I would go with booties. The earrings are GORGEOUS, but I think they are statements on their own and the necklace you've got on wasn't all that necessary. As Coco Chanel has said, "Always take off one thing (accesory, non important clothing item) before you leave the house." Nice outfit! I wish I could be an intuitive dresser and more creative when it comes to styling myself. But I'm one of those people who tend to have very simple outfits and wear them a lot. Especially since there are quite a few moments when my BF is like, I'm hungry, hurry up and get ready in 10 minutes. So not much time to think about it anyway. what a pretty dress and this jacket fits you perfectly! those earrings are also super cool and something unexpected with this outfit. simply lovely! I know this is a clothing post, but I love the pure and natural look of the makeup here. Could you do a 'bare essentials' posting with what you did here sometime?? Could be useful for most of us who end up having less than 5 minutes in the morning for makeup despite our best intentions. Have you ever tried a Herve Leger dress in xxs? I think it would look amazing on you. The dresses literally look like second skin! I'm totally digging the whole look! you look very pretty. One of your former invisible readers... but after I saw your cute OOTD, I just HAVE to tell you that I love your blog! 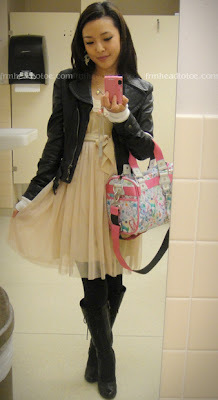 Your style is totally different than mine (you're so cute and girly) -- but that's why I appreciate it. I can never pull off a look like that without my friends being like, what? i try u discount code pinky paradise - not work - what to do? please say u me. How can u be so pretty and beautiful??!!! Wow! I love ur style!!!! Oh my god I totally love your style here. you are really beautiful. I also wanted to ask you what are the lashes you used there.